Where were you born? Who are your biological parents? Where did you live when you were 6 years old? For some children, these are simple questions with answers already known or easily obtained. However, for many children in foster care and for many who are adopted, they are mysteries and blurred memories. For those without answers, not knowing can be a tragedy. Beth O'Malley, MEd, was adopted as an infant in the 1950s. At an early age, her adoptive parents explained that they were not her biological parents but discussed the matter little beyond that. "When I became an adolescent, I couldn't talk about adoption without crying," she says. "Later on, I better understood that as unresolved grief." When it came time for O'Malley to get her driver's license, she first had to obtain her birth certificate. She went to the county clerk's office in the town in which she had grown up, only to find out later from her adoptive mother that the document should be in a different county—the one in which she was born. "I was so pissed off," she says. "How could [my mother] lie to me all those years? How could I trust anything [she] said? "But when I got to the other side of that, it was like 'Oh my God! I know where I was born! '” O’Malley continues. “It was such a primitive feeling of rootedness. Something shifted inside me. I felt so grounded. From that point on, I was able to talk about adoption." And she did just that, earning her master's degree in counseling and working as an adoption case manager for 30 years. Now in retirement, she is selling and helping to make lifebooks through her website www.adoptionlifebooks.com. Why lifebooks? O'Malley believes having a lifebook in her childhood would have changed her life. "Maybe I could have avoided some of the sadness," she says. And she knows, like so many adoption professionals, that lifebooks can and do change the lives of children who are adopted and/or in foster care every day. But what is a lifebook? "A lifebook is an essential tool to aid children in the child welfare system in understanding the narrative of their lives and the meaning of their changes. It helps children keep connections with their past and the people who are important to them,” explains Monica Johnson, MSW, lifebook program supervisor and coordinator for Lutheran Social Services of Illinois . She describes it as a "catalyst for conversation"—a way to help children and adolescents open up about their past, their traumas, and the changes in their lives. O'Malley adds that lifebooks help prevent those facts and memories from fading and blurring. "Trauma has a way of dulling and changing memories. The lifebook with its key life truths remains the same over time. As a child tries out assorted foster homes, they often lose life facts and an organized sense of history. The lifebook chronicles where they have lived and at what age, at a bare minimum. This helps the child with building a sense of identity." 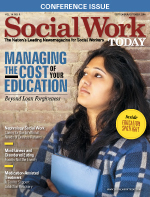 Like so many tools in social work, the lifebook will look different with every child, and even with every social worker, who often is affected by time, resources, and support. The lifebooks Johnson and her staff use consist of pages that can easily go into a binder. "We use two different books for two different age groups," she says. "We have our own for children ages 0 to 11, called My Awesome Life. We provide a different book that's published by someone else for our teens. And then we have kits that we give to our kids: a binder, the book that goes into the binder, double-sided tape, crayons, markers, and pencils." They also provide a box with handles, similar to a suitcase or briefcase. The children are able to decorate the box, keep the book and keepsakes in it, and "it can go easily with them if they have to move," Johnson says. There are different sections to the lifebook. Some sections are applicable to everyone while others are geared to specific situations, such as international adoption, trauma or, simply, adolescence. "Teenagers, they're a tough bunch to deal with," O'Malley says. "They're tired of writing, tired of talking about their life.” The teenage lifebook For When I'm Famous, created by O'Malley, is set up as a tool to open the door. “It helps them think about the different parts of their life and express their opinions without having it be too terribly clinical. It makes it a little bit more out of the box," she explains. At first glance, a lifebook may seem like a simple tool, with its pages for pictures, and fill-in-the-blank and open-ended questions. However, it represents and provides much more. Johnson and her team proved this with an applied research study, comparing children's functioning and ability to talk about their past with their foster families. The intervention group consisted of children receiving services, including lifebooks, from Lutheran Social Services of Illinois. The control group consisted of children at a comparable agency, but without a lifebook program. Through a series of questionnaires, the researchers found that the intervention group's ability to talk about their past and knowledge of their past significantly increased. Additionally, "Foster parents in the intervention group reported positive change in four out of six [functionality] areas: stress, attention, relating, and helpfulness. The children reported positive change in five out of six, adding emotion," Johnson says. She hopes this study will be one among many in the future, from multiple agencies and researchers. However, beyond clinical research, there is already much proof of the validity of the effort to be found in the participating children and their stories. Johnson describes a boy who thought he had destroyed his home. "He thought that he had started a fire. He had been playing with matches in the garage a couple weeks prior to the fire. The lifebook specialist was able to get the report from the fire marshal that said [the fire] came from the kitchen. She was able to show this to the little boy, and he was able to internalize that he didn't start the fire." Johnson also remembers a young woman's reaction at seeing her birth certificate for the first time. "She started to cry when she looked at it. Her handwriting was exactly like her mother's, who is deceased." At Lutheran Social Services of Illinois, Johnson has a team of lifebook specialists, including herself, who span the state, working with children in foster care and training child welfare workers and foster parents. The creation of the lifebook is collaborative, relying not only on the specialist but also the case worker, foster parents, therapist (if applicable) and, of course, the child. "It really is a team effort," Johnson says, “but the child is our guide." They start slowly, allowing the child to decorate the kit and get a feel for how to proceed. "We let the adults know how important conversation is. We have children who will just talk away, and children who need to take things slowly," Johnson says. This approach, with training, collaboration, and multiple forms of support, is the ideal but not always the reality. "It depends on what the lifebook culture is in the community," O'Malley says. "In some states, administrators are still kind of scratching their heads, saying 'What is a lifebook? '” In those cases, the creation of the lifebook falls to the foster parents or the adoption/foster care social worker—a task that can be overwhelming. There are resources such as O'Malley's website, which offers a free worksheet to get started, exercises for kids, and an e-newsletter with tips and advice. The Lutheran Social Services of Illinois also serves as a valuable resource, with lifebooks, training materials, and a multitude of dowloadable information as well as success stories available on its website www.lssi.org. In the meantime, O'Malley says, "Do what you can, when you can. Embrace lifebook work and see the little pieces as being as critical as anything else you're going to do on your caseload. The little pieces are going to be life changing."